Now Available In Stock – NON DAIRY BRAVO. 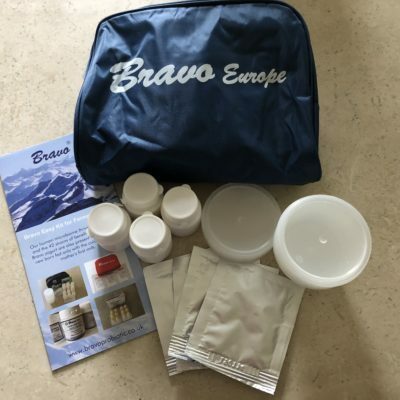 Bravo Easy Kit for Fruit Juice is a dietary supplement with Chondroitin Sulfate and probiotics for the home-made preparation of a fermented fruit drink. Bravo Easy Kit for Fruit Juice for fermented fruit juice is a combination of fermenting microorganisms, probiotic strains, and prebiotics according to an original proprietary formula exclusively developed by and manufactured for our Swiss company Silver Spring Sagl. 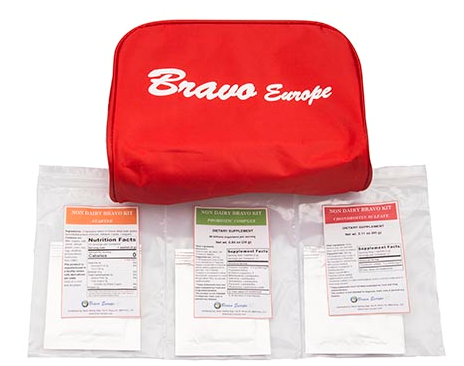 Bravo Easy Kit for Fruit Juice for fermented fruit juice is entirely made in Europe and contains exclusively ingredients from certified European sources; all the fermenting microorganisms, the probiotic strains, and the prebiotics in this product are certified safe for human use. All are manufactured exclusively for our Swiss company by state-of-the-art GMP-certified European facilities that guarantee the highest quality. 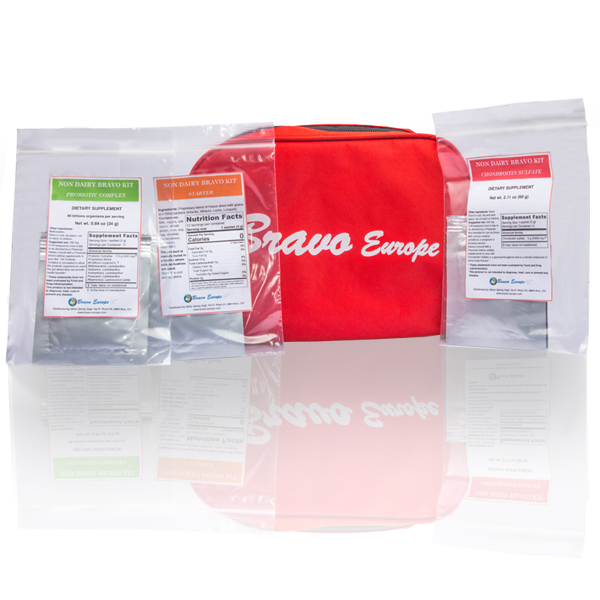 The unique formulation of Bravo Easy Kit for Fruit Juice for fermented fruit juice derives from the scientific research that demonstrates how fermented food products are beneficial as part of human nutrition. Bravo Easy Kit for Fruit Juice for fermented fruit juice is unique for the presence of fermenting strains, specific probiotics (including Bifidobacteria) as well as prebiotics (such as maltodextrins) and chondroitin sulfate with known properties that make the product a stand-alone game changer. Thanks to the proprietary, custom-made formula, Bravo Easy Kit for Fruit Juice for fermented fruit juice, yields a non-dairy probiotic drink with no alcohol content neither any sparkling texture at variance with other products. Bravo Easy Kit for Fruit Juice for fermented fruit juice contains the powders that are necessary to prepare, in your own kitchen, the final liquid fermented product that is ready to drink. The Kit has been designed to be user-friendly; it simply requires that you follow a simple and straightforward recipe. The philosophy behind our formulation allows an almost infinite number of customizations in your kitchen, at variance with most of the non-dairy probiotic drinks on the market, so that you can prepare your own drink in accordance with your individual taste, needs and habits. The use of Bravo Easy Kit for Fruit Juice for fermented fruit juice is very simple and it takes only few minutes of your work and then, 24 hours later, you will have your product ready to drink. Simply mixing 1 sachet of each type of powders included in the Kit in 1 liter of home-made fruit juice will yield, 24 hours later, your fermented fruit juice ready to drink, in an amount that will be enough for 7-10 days. 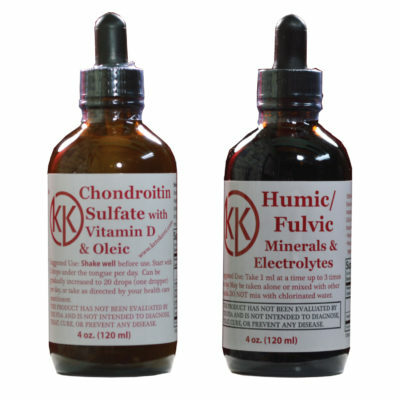 Please notice that the three components of the kit (Starter, Powder Complex and Chondroitin Sulfate) should not be used separately. Please notice: The recipe described below is the one that our company developed and analyzed for the total bacterial count, the measure of pH and of the alcohol content (zero). The product, in general terms, can be prepared using different recipes (dried fique or dried apricot rather than prune), or juices ready to drink (such as apple juice, orange juice or others; in this case there is no need to add sugar and lemon juice). However, the total bacterial count, the pH and the alcohol content might vary, in particular depending on the amount of sugars in the juices. In the large glass bowl, pour 1 liter of non-chlorinated potable water (such as, for example, mineral still water), 1 tablespoon of cane (or refined) sugar, 1 tablespoon of lemon juice, 1 dried prune with no kernel. To facilitate the dissolving of the powders in the home-made juice that you have just prepared in the large glass bowl, we suggest to proceed as follows: take a small amount (2-3 tablespoons) of the home-made juice from the large glass bowl and pour it in a small glass (or a small cup). Pour in this small amount of home-made juice the content of 1 sachet of Starter, 1 sachet of Chondroitin Sulfate, and 1 sachet of Powder Complex. With the help of a teaspoon stir well until you will get a smooth and creamy product. Now, pour this smooth and creamy product in the large glass bowl that you have previously prepared and containing all the other ingredients, trying to recover as much as you can from the small glass (where you have dissolved the powders). Some clumps may remain in the home-made juice; however, during the fermentation process they will spontaneously dissolve. Using the steel tablespoon, stir well the home-made juice in the large glass bowl, cover loosely the bowl with kitchen paper (just to protect from dust), and leave it sitting (fermenting) for 24 hours at room temperature in a quiet place, away from vibrations, heath, or blowing fans. The optimum fermentation temperature is between 16 and 26 °C (60 – 78 °F). However, we have formulated the product to be very flexible so that it can easily tolerate a wider range of temperatures while fermenting. Do not mix or stir during the fermentation. After the fermentation (that is 24 hours from the beginning), mix well the content of the large glass bowl with a steel tablespoon, transfer the product into a glass jug, filtering it through the metal strainer to remove the traces of fruit, if necessary. The fermented fruit juice can now be stored refrigerated in a common fridge for up to 10 days in the glass jug, loosely covered with aluminum foil. The table summarizes the nutritional information for 100 ml (3.3 liquid oz.) of the fermented home-made juice prepared according to the suggested recipe. Store the Bravo Easy Kit for Fruit Juice (that is the Kit with its three components) in the refrigerator in its original plastic bag at a temperature between 2 and 4 °C (35-39 °F) and far from humidity. The Kit with the powders can be stored until its expiration date, as written on the labels of each component. Store the fermented fruit juice in its glass jug in the refrigerator, at a temperature between 2 and 4 °C (35-39 °F). The fermented fruit juice ready to drink can be stored in the refrigerator up to 10 days from the day of its preparation. The product, for the abundance of fermenting microorganisms, probiotics and prebiotics will look opaque (non transparent) and, after sitting into the refrigerator for a while, a visible sediment on the bottom can be appreciated. The presence of opaqueness and sediment is an indicator demonstrating that the fermentation process is occurring. Before consuming the drink, mix it very well with a steel tablespoon; the suggested serving size is 100 ml (3.3 liquid oz) per day. 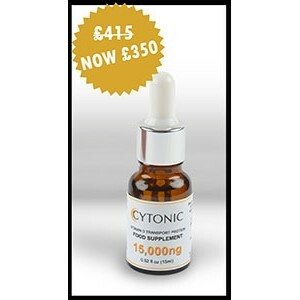 The product can be consumed pure, as it is (100 ml or 3.3 liquid oz per day), or diluted with non-chlorinated potable water. Do not exceed the suggested serving size. Keep the product out of reach of children. Not intended for use by those with serious medical conditions or pregnant or lactating women. Always consult with a Physician before adding supplements to your diet. Bravo Easy Kit for Fruit Juice for fermented fruit juice is milk-free, soy- and gluten-free, and it does not contain Genetically Modified Organisms (GMO). Please notice: the product is manufactured in a facility where milk and milk derivatives are used. All the procedures to minimize the risk of cross contamination with milk are followed. Bravo Easy Kit for Fruit Juice for fermented fruit juice is not intended to diagnose, treat, cure or prevent any disease.